Poll: Vote on my next retro game adventure! So it’s been a long time — pretty much since the end of 2014, really — since I’ve done retro gaming posts here on Bio Break. Mostly I was feeling a little burned out on how I used to do them (very time-consuming), plus I got real busy with the whole Massively Overpowered start-up. Anyway, I’ve been meaning to bring it back in some form, and so what I think I’ll be doing starting next week is to pick a game and play it a bit over the course of one week (with expected screenshots/commentary). At the end I’ll evaluate how it’s going and whether I want to move on to a new title the next week or if it’s so gripping that I want to keep on going. I have SO MANY titles stuffing my GOG.com library right now that are unplayed that I just don’t have the time to do full playthroughs of each, but would like to at least sample them and see if they have what it takes to get me hooked. Like a blog reality show or something. So let’s put the first game for the return to retro gaming up for a vote — what would you like me to play next week? You might recall how impressed I was with RIFT’s recent overhaul of its wardrobe system, which combines functionality with extreme ease of access. 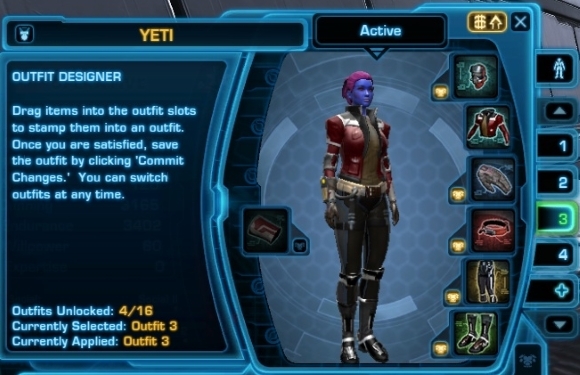 I’ve been waiting to see how SWTOR and WildStar did with their new wardrobes, and while WildStar has yet to reveal its, SWTOR popped out the costume designer with this week’s 3.2 patch. Oh, don’t get me wrong, it’s way, way better than the fiddly adaptive armor that the game’s struggled with since release. And something is better than nothing. But overall it’s definitely behind the curve of some of the better examples in the industry (RIFT, Guild Wars 2, LOTRO, EverQuest II). Let’s start with the positives, because I’m all about being fair. 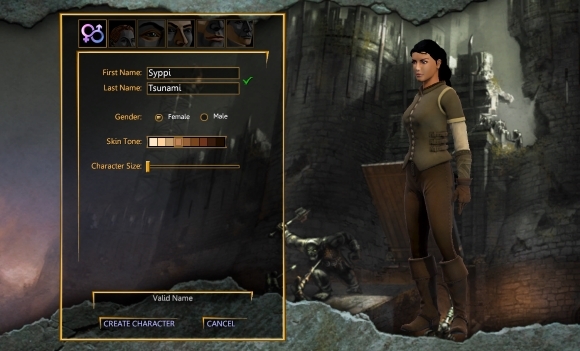 The costume designer is instantly accessible in the character UI (no finding a certain NPC for this) and allows for up to 16 saved outfit slots, which is 15 more than Guild Wars 2 offers. And for a free-to-play player, I was happy to see that buying new slots could be done fairly cheaply with credits. It also works for what it does, allowing you to drag over a real piece of gear into a slot to “stamp” it while keeping the gear elsewhere. Despite what BioWare claims, this doesn’t really save me on inventory — I still have to hang on to that gear in my increasingly cluttered cargo bay if I want to use it again elsewhere — but it does work. Putting together an outfit and swapping between what you’re wearing is just a button click away. I was pleased to see that BioWare’s opened up the field to use pretty much any piece of armor (although not weapons) for cosmetics, including your standard greens. And while allowing players to now use any armor class for cosmetics seems to have upset some of my guildies (who felt strongly that it took away from the uniqueness of certain classes), I was cheering a widened array of options. In this area, SWTOR actually has a leg up over GW2, the latter of which is still armor-class restricted. But for every step forward, there are a few taken back with this system. Dyeing armor pieces is still handled in the awkward “you have to slot an item into a chest piece” fashion instead of taking a cue from RIFT/GW2 by allowing easy access to colors in the designer itself. And since the designer doesn’t let you unify to chest colors while putting together outfits (you have to be wearing the outfit and then click that button), it’s sometimes hard to tell what the color scheme will end up being. I wish that the game took a cue from RIFT/GW2/LOTRO by storing cosmetic gear in an inventory-free unlockable screen so that you could easily select pieces while building an outfit. Instead, I had to open up my cargo bay, preview through pieces, transfer the gear to my inventory, then stamp it from my inventory into the costume designer. WAY too many steps. WAY too cumbersome. The kicker is that BioWare, in its infinite wisdom, decided that the costume designer also had to be a money sink. OK, it’s not going to make me go broke, but I couldn’t help but be resentful that every item I slotted would cost me credits. At least it’s credits and not cartel coins, but it does leave a sour taste in my mouth. At least for my efforts I now have a selection of outfits from which to choose in my adventures. It’s just a shame that what could’ve been a top-of-the-line ride ended up being a servicable economy car. I’ve seen a lot — a LOT — of silly and bizarre mounts in MMOs, most of which I can excuse under the pretense of “fantasy” and “fun.” But this one… whew. I’m sorry, I hit a mental speed bump when I saw it and crashed to a halt. Is this the worst and/or silliest mount ever designed? A giant rabbit? Rabbits are prey creatures that are prone to flight and/or freezing in fear when confronted with any predator, which fantasy worlds have in abundance. Does the rabbit walk/run, which it isn’t designed to do? Or does it hop incessantly, causing extreme motion sickness and whiplash for the rider? Does the presence of a shirt and hat denote some sort of sentient intelligence going on here, in which case I have to wonder why this smart hare is allowing someone to ride on its back? Or is it just the owner dressing up its pet like a grandma does to her little shivering rat-dogs? What accounts for the rabbit gigantism in ArcheAge and why doesn’t the entire population eat rabbit stew every night as a result? Shroud of the Avatar: Welcome back, Avatar! 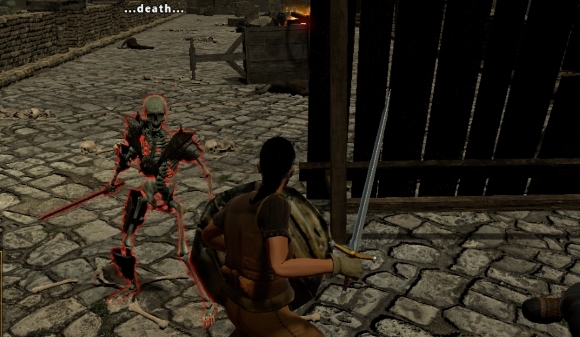 The desire to check out Shroud of the Avatar’s been growing in importance to me over the past couple of months, if nothing else than seeing how much SOTA has going on with its community these days. I’m not normally a beta guy, nevermind a pre-alpha peeker, but if there are already dev-led events and player gatherings, then it looked to me to be more than just a mere test. 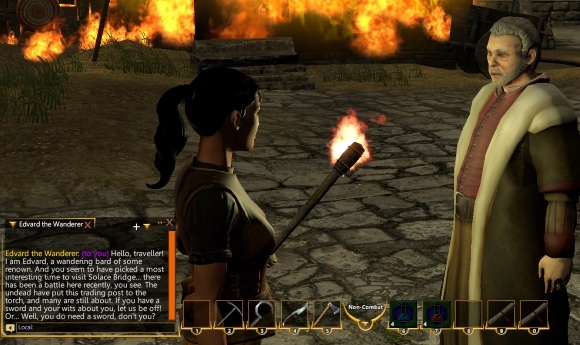 Besides, out of all of the crowdfunded projects, SOTA has been speaking to me as the MMO that I’d most like to try. I was never big into the Ultima series (or even that aware of it), nevermind Ultima Online. But people speak so highly of the creativity and actual roleplay of those worlds that I didn’t want to miss out on this spiritual successor. So yesterday I used my allowance to grab a copy and take a few timid steps into this “construction zone” (as the loading screen warns). The opening movie has a strong Ultima vibe, blurring reality and game fiction as it posits that you — the gamer — have somehow accessed this fantasy land for real. I love how the movie assumes that you’d be surfing Richard Gariott’s Facebook page as part of your nightly excursions. That is not creepy at all. No sirree. Cheezy movie aside, can I say that I am in love with the music already? So cheery, so renaissance faire-like. I’ve had the character creation theme looping while writing this portion and I haven’t gotten sick of it yet. Here’s my test character. The character creator is decent but not astounding. There’s about a half-dozen hair styles, two genders, and a while lot of sliders for facial features — and that’s it. Still looks nicer than I’d have assumed. Here I am moments after entering the game. The lighting is nice — not great, but again better than I would have thought. How low are my expectations for these indie games again? 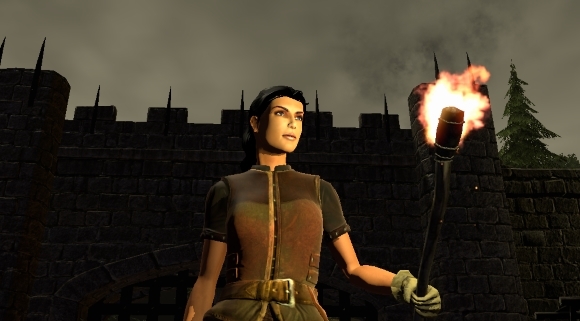 There’s definitely a heavy old-school vibe going on with SOTA, and I’m not just talking about older MMOs. Right from the start, you have to actually type replies to NPCs. Whaaa? Where’s my brightly colored dialogue wheel with mood icons? Anything more complicated than a Denny’s menu, I can’t handle it (just kidding). I like these immersive touches but I’m a little worried that it’s going to be so foreign as to be off-putting. For example, I dig how you actually drag objects from the world into your inventory, but I am not thrilled with the camera controls or the laggy movement. It’s functional, just not great right now. And the combat? I don’t even know where to start. The tutorial tells you to go up to a training dummy and hack away for a while, but it’s not intuitive at all. There are several skills that won’t light up and my character doesn’t automatically scoot forward a couple steps when I target the object in order to get within range. When I do get close enough and find a skill that lets me swing, the sound effects… phew. Well, this is pre-alpha, right? Everything I write here has to have that caveat, because these are the most pathetic sword sounds I’ve heard since the IBM PC-Jr from the mid-80s. It’s like someone crushing a small turtle. Pfft. Pfft. One thing that did please me greatly, however, is that my inventory not only had a full manual but also a guide to player-run events. Like, a multi-page book FULL of dates and events for that month. Egads, SOTA is hopping with stuff. Oh here’s a little tip: “Z” is the button that takes you from non-combat mode to combat, which is important since you have different hotbars for each. Also, when you’re in non-combat mode, you heal up faster. Not to keep picking on the sounds, but they don’t even sync up to combat actions, which makes them all the more noticable. OK, getting more of a grip on combat. One skill to inflict a bleed, one to help me dodge, one to do two quick attacks. Skeleton, you are toast! The (temporary) tutorial quickly over, I’m ported to Soltown to begin my proper multiplayer adventures in a much more lush setting. I’m glad I’m taking my time to poke around the settings and controls, because I do feel that I’m a little more steady on my feet than I was at the start. Now what? The game told me to find a guard, but I might have to go exploring. 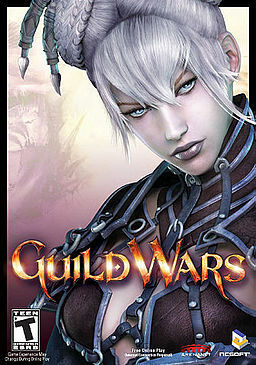 If you haven’t been able to tell by your Twitter feed (assuming you have one), today’s the big 10th anniversary of the original Guild Wars, which came out way back in 2005. This is a sort of bittersweet recognition by many, since ArenaNet has put Guild Wars into maintenance mode for some time now and the collective focus has shifted to the sequel, leaving the original to quietly fade into its autumn years. Compared to the ongoing development of other older MMOs — like WoW, EVE, UO, and EverQuest — this seems a little wrong, somehow. My 2005-era Guild Wars tale is probably less thrilling and sentimental than those you’ll find from true fans. I did pick up a copy that April (which was right after my wedding, so there’s another big 10-year anniversary) and was intrigued by the buy-to-play model, which was unheard-of at the time for online RPGs. I remember the art style and the music being absolutely breathtaking — so well done, in fact, that it even holds up today. And the idea of mix-and-matching classes and collecting skills was pretty cool. But Guild Wars never gripped me the way I saw it do to others, probably because I was firmly in the claws of World of Warcraft at the time and was a little disappointed as why this game felt smaller and the loot insignificant in comparison. The mission system also confused me (at the time) and I couldn’t quite get the hang of grouping up with others to progress. So it wasn’t before long that Guild Wars got shelved, although I’d take half-hearted stabs at it throughout the years. It was only really when Guild Wars 2 was announced and the whole Hall of Monuments tie-in revealed that I got enough determination to see the game through its campaign, if only to secure a few goodies for the sequel. My guild was immensely helpful in propelling me through some of the tougher missions, and I was able to walk away from the game having gone through all three campaigns’ storylines. And while today I still feel very much like an outsider to the whole ArenaNet/Guild Wars community, I can appreciate the artistry and business saavy that powers this franchise and the passion that it imbues among fans. So happy 10 years, Guild Wars! Enjoy your well-earned retirement. If things seemed a little off… perhaps too quiet this past week, that’s because I wasn’t really here. 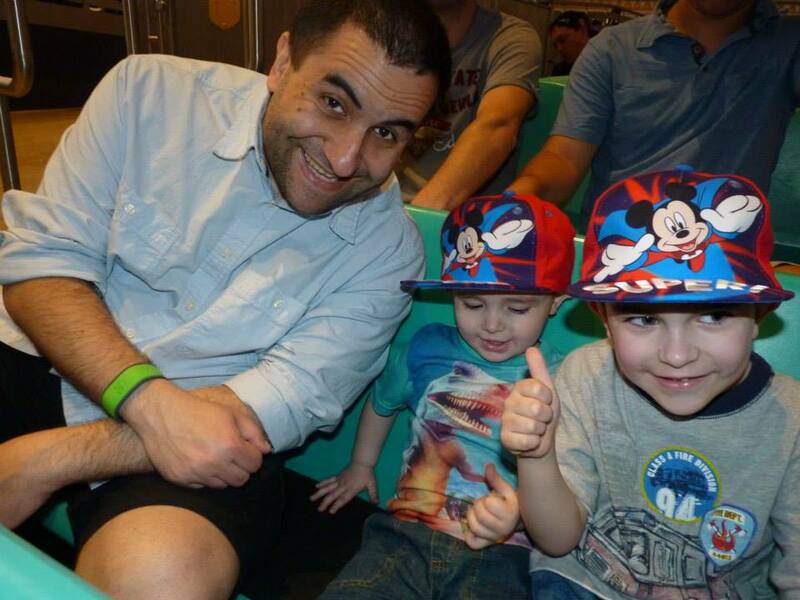 Our family went off on our first big non-relative-destination trip ever: Walt Disney World. We’d been planning this trip for years, waiting until the kids were old enough to (a) enjoy, (b) comprehend, and (c) remember going there. A WDW trip two years ago had to be put on hold because of my youngest’s birth, but we figured that the older two at 5 and 6 would be in a good position to have fun and tall enough to get on many of the rides. It turns out that even our 2-year-old could go on a lot of Disney rides, which is probably not true of most amusement parks. Seventeen hours (split among two days) of driving later, and we had gone from the late winter of Michigan to the 90-degree summer of Florida. While I’d been to Disney several times in my life, this was the first time that I had ever stayed on the property. We got a suite at the Art of Animation Resort, which turned out to be perfect for us — the room had three beds, a fridge, a great pool, and bus access to the parks. I’m not really into the Disney culture, apart from liking the Pixar films, but it’s hard to resist the sheer polished experience that WDW provides and to get into the spirit of it. For me, I’ve always loved the dark rides and the attention to detail that the Imagineers put into these. 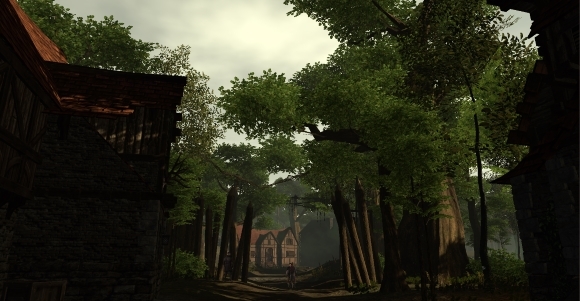 As with in MMOs, I’m deeply affected by environment, particularly well-crafted ones that are designed to evoke a certain mood. Some of the Disney queues were almost as involving as the rides themselves (and I appreciate the work that WDW has been doing to add interactive queue elements for the kids during these sometimes-long waits). 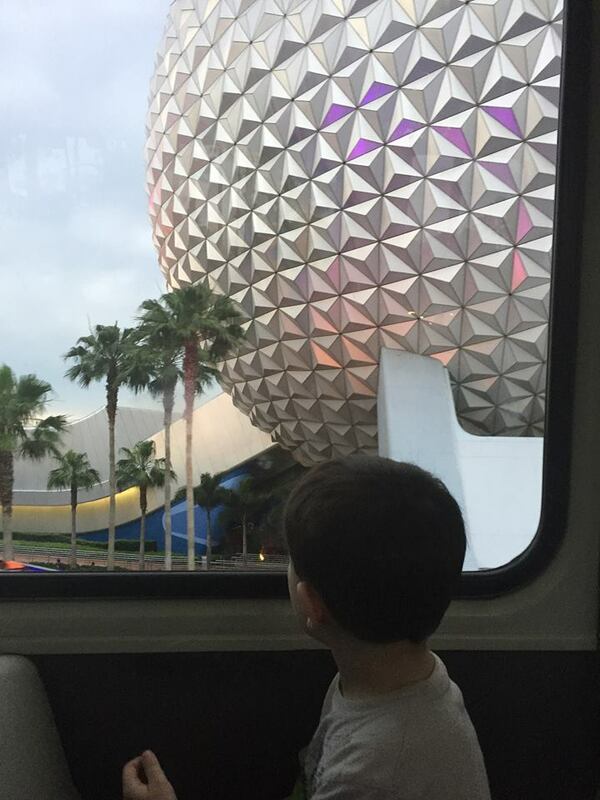 We did one day at Epcot, one at Animal Kingdom, and two at the Magic Kingdom. I got to go on my favorite ride, the Haunted Mansion, three times, and we hit about everything else except for a couple rides that required a few more inches on the kids (such as Space Mountain), were closed for repair (Jungle Cruise), or had way too long of a wait (Splash Mountain). Another first for me was experiencing the park with the new FastPass system and mobile app. Nowadays you can sign up for three rides per day at a park to go through a faster line. I did my research ahead of time and discovered which rides typically have the longest lines. Between the FastPasses, a lower seasonal attendance, and using the mobile app to see what the wait times were on rides at any given moment, we really didn’t end up waiting that long for anything. I think the longest wait we had was about 20 minutes for Soarin’ at Epcot. We had several great non-ride experiences, too. The kids loved the Turtle Talk with Crush experience as well as the Enchanted Tales with Belle interactive play. Ohana had a wonderful character breakfast where the kids got to meet Lilo, Stitch, Pluto, and Mickey. My son had his sixth birthday that day, and Lilo was jumping up and down, signing that she was six too. I got a daddy-daughter date at Cinderella’s Royal Table, which was all sorts of amusing to see what questions she had for the princesses. I more or less completely unplugged for the week and was happy to note that I wasn’t suffering any sort of game-deprivation jitters. Instead of gaming in what little quiet time I had, I caught up on some reading and chewed through four books. The week was over far too soon and we headed back to reality (with a side trip to the Chattanooga aquarium, which is totally worth the effort to see). I’m still catching up on work and getting back into my routine — and kind of wishing that we had one more day to go around the parks. Oh well, in another year or two, I suppose. Son: Dad, why are you killing those animals? Son: But isn’t this their world? Me: …let’s go look at my rocket ship house again!